As us LOTR fans patiently wait for “future” Hobbit film to stop mercilessly teasing us about its off-again-on-again’ness we can look at these precious LOTR tattoos (bad pun sorry lol!). To my surprise and disappointment I couldn’t find any Legolas Tattoos! BUT @youbentmywookie found this Legolas Tat after I tweeted my dilemma, hey it’s better than nothing! If you find one send it on over! Next Post → Superheroes Need Health Care Too! 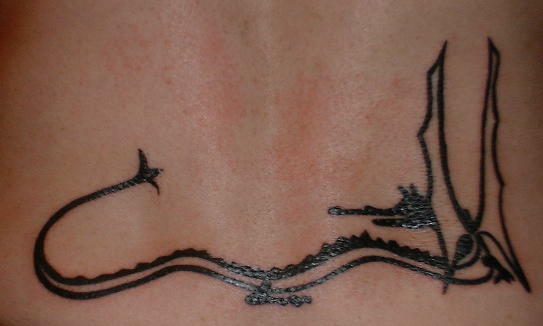 I would never have thought to google some tattoos from LotR, but damn, those are nice. It makes me want to reconsider my second tattoo! Thanks for the post! yeah I love these! I think the drawings straight from the book are beautiful and elvish is so elegant! Those are amazing. The Aragorn one really looks just like him! Hah, oh dear. That doesn’t say Elendil at all. All it says is “ldl”. ooo really? I just took the quote straight from the person. uh oh! I have a legolas tatt, I have no idea how old this site it, do you want it? It’s nothing as nice as those ones you posted though. Oh man! The Doors of Durin tat is AMAZING! I would also love the White Tree of Gondor. Beautiful! I’d like to see some Ent tats..I’m gonna have to google that now.